I am working on Lent, can you tell? Sometimes I just need to get it out of me, work on it for a while. Sermon writing and worship planning are creative processes and I am a visual thinker or learner. I spent years fighting this, mostly because until college I didn’t realize that visual learning was even an option! But once I embraced the chaos that is in my mind, found a way to get it on paper, I found organizing thoughts quite simple. I have also embraced the fact that thoughts, memories, and inspiration comes over time. I have been planning this Lenten series on Atonement for a few months, but I need to get it on paper, get it out of myself, which yes, sometimes means getting it onto newsprint and plastering it on my wall. God, I am thankful for the gift of visual learning, for the beauty of thoughts organized, and for colorful pens. But most of all, dear God, for the inventor or post-it note newsprint. Your creation is amazing. 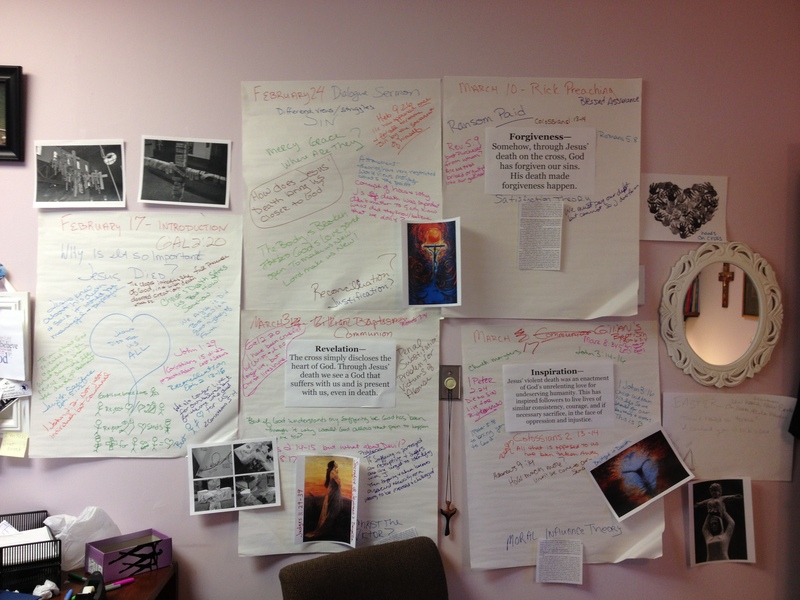 This entry was posted in Ministry, Worship and tagged color markers, creative process, Lent, thinking, visual, visual learning, worship planning. Bookmark the permalink.